Thiruvambadi Krishna Temple is a temple very much in the hearts of the people of Thrissur! The Temple is dedicated to Lord Krishna as a child & Devi Vishnumaya. Even though small in stature in its physical appearance, Thiruvambadi Krishna Temple is highly significant as a Mahakshethra due to its extensive rites of worship. Moreover, the temple is an active participant in the world famous colorful festival – the Thrissur Pooram. In fact, the Pooram starts off with the colorful ceremonious procession, Madathil Varavu from the Thiruvambadi Temple. The temple holds the distinction of being the only temple in Thrissur with a gold-covered flag-mast and has the highest number of festivals and auspicious days celebrated of all temples in Kerala. This is a complete guide with lots of useful information. You can jump straight to these sections to touch on the specifics. In the legends, the Thiruvambadi Krishna Temple was earlier located in Edakkalathur headed by a local administrator called Moose of a well-respected family. In the turn of the sixteenth century, a girl from his family fell in love with a young man of a different religious sect, and it created tension and conflicts amongst people. Some villagers were fearing a communal riot transported the idol to Thrissur and sought the help of a childless couple at the “Kandanathu Mana” (Kachanappilli Mana). The couple installed the idol in a hall within their house premises. As ardent worshippers of Kodungallur Bhagavathy, they regularly used to visit the temple. When they grew old, they could not travel to Kodungallur often, and the Bhagavathi is said to have accompanied the Namboodiri on his Olakkuda (Palm leaf umbrella) on his journey back. The Devi’s presence was consecrated onto a pillar of their Nadumuttam. Later on, the Namboodiri installed the idol of Bhagavathi on the left side of the Lord Krishna sanctum. The oldest record of the history of Thiruvambadi Temple dates back to the 16th century. The temple was formerly situated at Edakkalathur, 20 Km Northwest to the Trichur Town. The idol was transported to the present place by villagers, and a childless couple at the Kandanath Mana were given the custody. 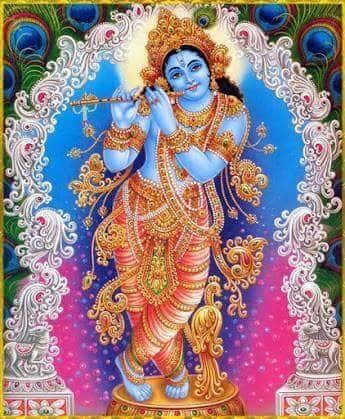 They considered it as their own child, and Lord Krishna was so impressed by their devotion that he acquired a different posture with a flute in one hand and the other hand outstretched to accept the butter regularly offered by the couple. The temple ownership was later on passed to the public by the couple. Thiruvambadi Krishna Temple is built in the impressive Kerala style architecture. The original temple was constructed in the 16th century, but the current structure was built during the reign of Raja Rama Varma or Sakthan Thampuran in the 18th century. 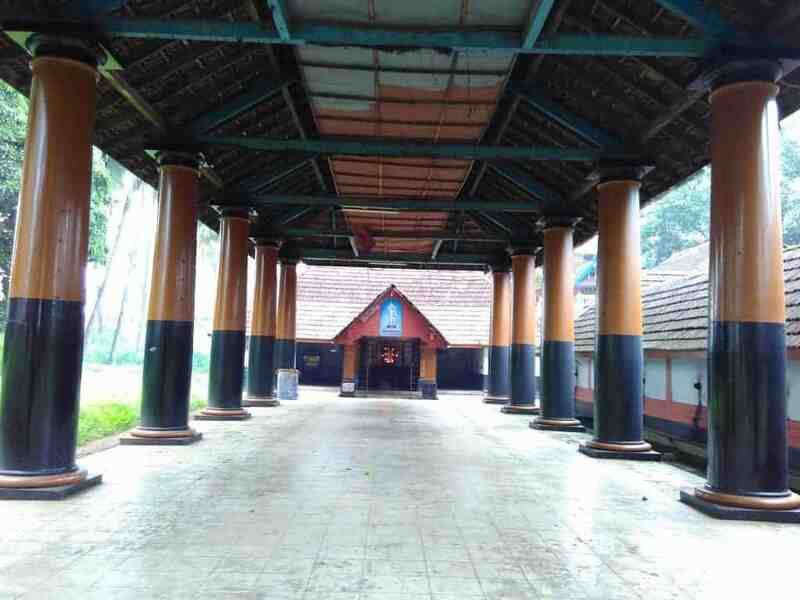 A pillar dedicated to the Kodungallur Bhagavathi is part of the temple. The main deity of Thiruvambadi Krishna Temple is Lord Krishna in his infant form. The deity has a flute in one hand and the other hand outstretched. Goddess Bhagavathy as Devi Vishnumaya is installed just to the left of the Lord Krishna idol. Lord Ganesha & Dharmasastha along with the founders of the temple are worshipped as separate deities outside the Nalambalam. Other deities include Kukshi Ayyappa, Manikanda, Ghandakarna, Raktheswari, and Bhairava. Book your journey through WhatsApp. Click now. Day and night festivities mark the birthday of Sri Krishna at Thiruvambadi Krishna temple. Celebrated with all pomp & splendor, on this day, the temple is lit up with lamps and 5 decorated elephants together with Panchari Melam are taken out in procession for the Ushassiveli. The Navarathri (Dassra) celebrations are held for 10 days complete with music concerts, bhajans, dances etc. Goddess Saraswathy is worshipped and devotees bring their books for the Pooja here. On Vidyarambham day, Vijayadasami young kids are initiated into learning. The Ekadasi day in Dhanu is celebrated on a grand scale at the temple. Elephant processions, art performances, Panchavadyam, drum concert etc. are held on the day. 10 days long Sangeetholsavam precedes the Ekadasi Festival. The harvest festival celebrated in Karkidakam. Newly harvested paddy stems are worshipped in the Lakshmi-Pooja & distributed among the devotees for keeping in their households. A sacred day celebrated in remembrance of Sudama’s visit to Sri Krishna, with a pouch full of beaten rice. The Lord is offered well cooked sweetened beaten rice at the 3 p.m special pooja and the ‘Prasad’ distributed to devotees. In Vrischikam, Goddess Bhagavathy’s form is created on the floor within the Nalambalam, using herbal powders of different colors. The temple oracle blesses the devotees dancing around the Bhagavathy’s figure. The Kalampattu ends with the Vela. The festival to appease Lord Unnikrishna that falls in the Kumbham month and continues for 8 days. For the Pallivetta & Aarattu, the deity is taken out in an elephant procession accompanied by percussion ensembles. Purificatory rites – Dravya – Sahasra Kalasa’ precedes the Thiru Utsava and last for a week. The idol was consecrated in the sanctum on Punartham aster in Meenam. It is celebrated every year on a grand scale. The most critical & colorful festival of the Thiruvambadi temple! It starts off with a ceremonial procession called Madathil Varavu to the Vadakkumnathan temple. Caparisoned elephants and giant umbrellas add color and pomp to the procession. Paramekkavu & Thiruvambadi temples compete with each other exhibiting their best art forms, traditional orchestra & fireworks which is a gorgeous feast of color & sound! Rigveda Manthras and floral tributes are offered in an 8-day long yagna at the temple every year. It usually precedes or succeeds Sri Krishna Jayanthi. In the Thulam month, chanting of Krishna and Devi names, one lakh times, is conducted. Daily Annadanam for 100 persons is held at the temple. Large scale Annadanams are conducted on special or festival days. Devotees can partly or entirely sponsor daily Annadanam or Annadanam on special occasions. One day’s Annadanam cost: Rs.2500. A 9-day long Sampoorna Krishnanattam is staged at the temple every year. Two Bhagavatha Sapthahams are held each year by the Devasthanam connected with Navarathri and the Vaisakhamaasa observance. Other Bhagavatha Sapthahams, Narayaneeya Sapthahams, Devi Bhagavatha Navahams etc. are also held as offerings by sponsors. The Ramayana discourses are conducted for 30 consecutive evenings in the month Karkidakam (July – August). Morning 04:30 AM to 11:00 AM. Evening: 04:30 PM to 08:30 PM. 5 AM: Vakacharthu (the holy oil bath of the Lord). 10 AM: Ucha Pooja followed by Seeveli. 6.15 PM – 7 PM: Arathi. 8 PM: Athazha Pooja followed by Seeveli. Traditional dress code exists for entering the temple and entry is restricted to Hindus only. Men can only wear Mundu & Veshti, and boys can wear shorts. Women can wear Saris, skirts & Salwar Kameez. Thiruvambadi Krishna Temple is located at Patturaikkal, at the heart of the Thrissur city. By Air: Cochin International Airport – 54 km. By Rail: Poonkunnam Railway station – 500 mts. By Bus: Thrissur Bus stand – 2 km. 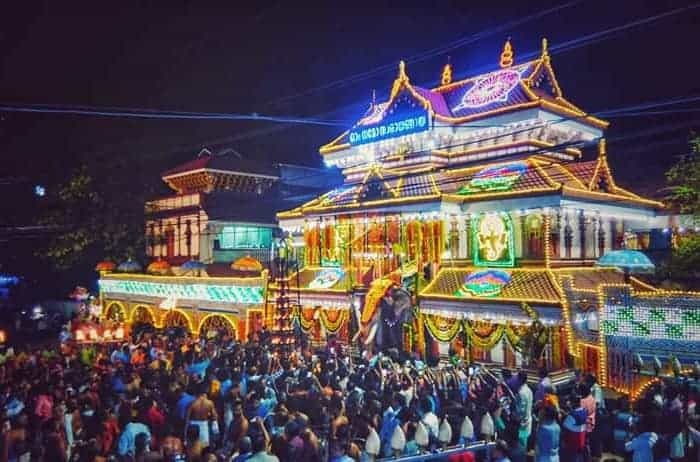 The Bhagavathy temple is the strongest contestant in the Pooram festival competing with the Thiruvambadi temple in its elephants, giant umbrellas & the traditional Palachottil Melom. One of the most significant Shiva temples in Kerala, it is believed to be the first Shiva temple built by Lord Parasurama. This temple is also known as Thenkailasam or Vrishabhachalam. 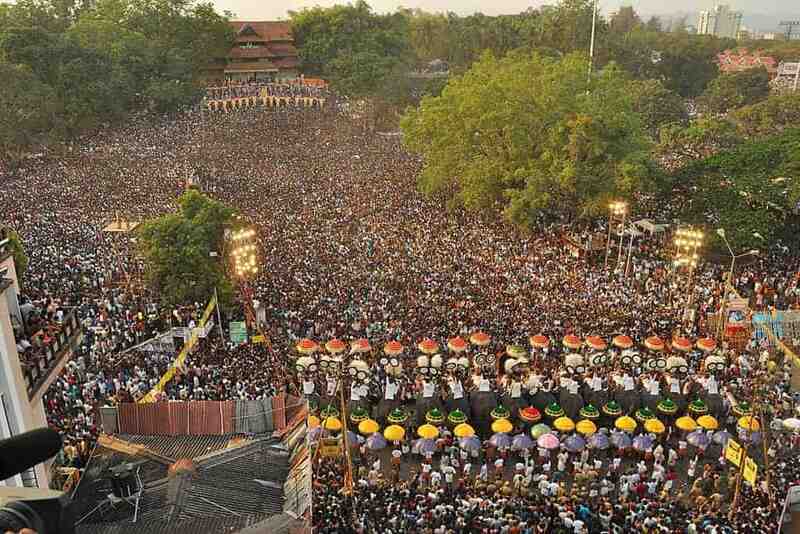 Thrissur Pooram is held in front of the Vadakkunnathan temple. Read more: Vadakkunnathan Temple &#8211; A Legacy in Heritage, Culture &#038; History! Now that you know more details about Thiruvambadi Krishna Temple which might have triggered your interest, if you are planning to visit the same do let us know. You can explore places in Trichur at your leisure. Don’t forget to customize your Kerala tour package with Blue Bird Travels for an incredible holiday experience. Book now for a memorable holiday in Kerala. Contact us today for a FREE Holiday Plan. Vadakkunnathan Temple – A Legacy in Heritage, Culture & History! We are leading car rental company in the State of Kerala for the past 24 years. We are affiliated to the Blue Bird Industries, functioning and providing excellent services for all its customers and clients since last 40 years.